John le Carre‘s spy novels were always a cut above for me; him and Frederick Forsyth ruled my thriller firmament in my teens, when the second-hand book stores were raided for the Colin Forbes, Len Deightons, Adam Halls, the Bond books, and soforth. It was le Carre’s mood that won me, the sheer honesty of his tales in which grey was the colour de rigeur and the good guys, if you could find them, were never guaranteed of victory. As with the Cold War, everyone was playing for a draw. In A Delicate Truth, his latest, he examines matters of conscience and political expediency, as a former British diplomat and a serving public servant find an incident on Gibraltar has not so much a delicate truth but a damned inconvenient one for Her Maj’s government. Against the backdrop of terrorism and rendition, mercenaries and dirty tricks, it’s a fraught tale of men unable to sleep easily with guilt and the ways in which the system seeks to silence them. The characters are stoic, suitably reserved, in their dealings, and the dialogue is brilliantly esoteric, with echoes of phrases used to at times Yes Minister levels of cutting effect within the overall atmosphere of growing malevolence. Le Carre knows when to be sparse and when to use his astute descriptions of setting, a wonderful example of crafted world building. While the end note was superb, the actual climax felt a little convenient, just a touch, but in no way undermined the story or the carefully presented character arcs that brought it about. It’s been a long time since I devoured The Spy Who Came in from the Cold and Tinker Tailor Soldier Spy — the Tomas Alfredson movie was beautifully realised — but A Delicate Truth takes me right back to the joy of those masterpieces. Le Carre is as foxy as he ever was. 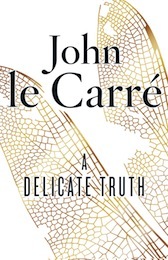 This entry was posted in books, review and tagged delicate truth, john le carre. Bookmark the permalink.